Infection control is the most vital and fundamental aspect of health-care practice pertaining to the faculties of medicine, surgery, or dentistry. The nature of dental procedures involves occupational exposure to blood and saliva that might carry these microorganisms. Dental health-care professionals and dental patients are, therefore, at a high risk for developing infectious diseases. This article emphasizes the importance of infection control in a dental office. It describes the protocol to be followed in a dental clinic setup. Steps in health care waste management have also been discussed. It is extremely important for a dentist to follow a protocol to facilitate cross-infection control in the office and to prevent cross-contamination between the patients, dentists, assistants, and ancillary staff. Personal protection, decontamination/sterilization of instruments and materials, and formulation of an infection control policy have been discussed. Dental office to community, including the dental team's families. Treatment areas are defined as any area where direct intraoral mucosal contact occurs. Examples of areas where direct mucosal contact occurs are operatories, radiographic processing areas, and oral hygiene instruction areas. Treatment support areas are where indirect patient contact occurs through directly handling contaminated procedure support items such as impressions, instruments, and exposed film. Examples of these areas are the laboratory, IRC, and radiograph processing room. Nontreatment areas usually require no direct patient contact. The business office, reception room, patient lavatory, staff lavatory, staff lounge, and private offices are considered nontreatment areas. Patient treatment areas generate the highest level of microbial-laden spatter. These areas must be separated from the treatment support area as well as the nontreatment areas. Careful office planning in design and remodeling can maximize this reduction [Figure 1]. Patient and visitor traffic flow must avoid passage through the laboratory, IRC, or other treatment and support areas. Direct access should be available from the reception area to the scheduled operatory. Consultation areas should be located closest to the administrative and reception areas, followed by the hygiene/patient education room(s) and full treatment operatories. Longer appointments should be scheduled in the most distant operatory with short visits scheduled in the first treatment rooms. This directs the heaviest flow of patient/visitor traffic away from extensive treatment and treatment support areas. All floors, walls, surfaces, cabinets, drawers, and equipment must be capable of being quickly and easily cleaned and disinfected. The use of wood surfaces, textured wall coverings, stuffed animals, and fabrics for decoration should be minimized. Smooth and seamless nonporous materials will inhibit the collection and protection of microbes. Carpet should not be used in treatment or treatment support areas. Continuous roll hard vinyl floor covering has been recommended for several years. Tile squares create cracks and crevices that harbor debris. Some carpeting is now available with an antimicrobial agent, but as of now, it is relatively untested. Aluminum should also be avoided on drawer handles, pulls, or switches, as it can also be affected by some chemical agents. Waste receptacles in the treatment and support areas should be recessed into countertops or cabinet fronts. Openings should be large enough to dispose of debris with ease. Treatment room receptacles should be used for handwashing waste only. 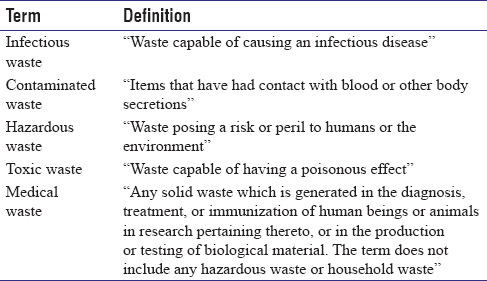 "Medical waste" items taken from the mouth and soaked with blood or saliva (e.g., cotton rolls, gauze, pellets, and tissue "packs" from treatment procedures) should be disposed into biohazard containers in accordance with the governmental regulations. Puncture-resistant leak-proof biohazard containers must be used for "sharps" (for example: needles and BP blade). The operatory should be designed with adequate work surface to accommodate preset procedure trays and support armamentarium. Drawers should be deep enough to accommodate sterile packages of extra instruments, burs, and disposables. Drawers should be made of impervious materials and should be easily removable for cleaning and disinfection. All instruments should be retrieved from the IRC and returned at the conclusion of the treatment. 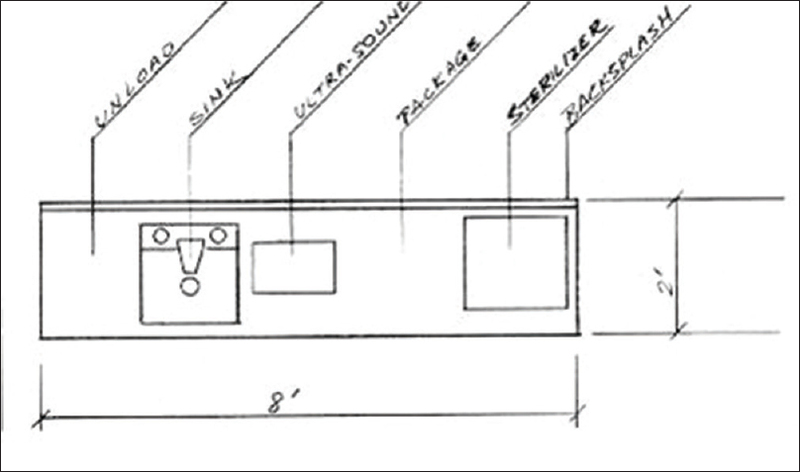 Cabinetry must also support small auxiliary equipment such as curing lights, and other support items that are impractical to remove from the operatory after each appointment. Be sure to protect these items from aerosol and spatter. Work areas must have a positive ventilation to control noxious vapors from various chemicals used in laboratory and sterilization areas. In addition, considering that microbes are inevitably transported from one area to another via ventilation systems, these systems must be designed to prevent recirculation of contaminated air. The IRC has been the most overlooked and underestimated space in dental office design . The IRC serves as the nucleus of the office infection control program and therefore must be conveniently located to all treatment areas. The IRC must also be designed in an area that avoids direct patient traffic pathways. 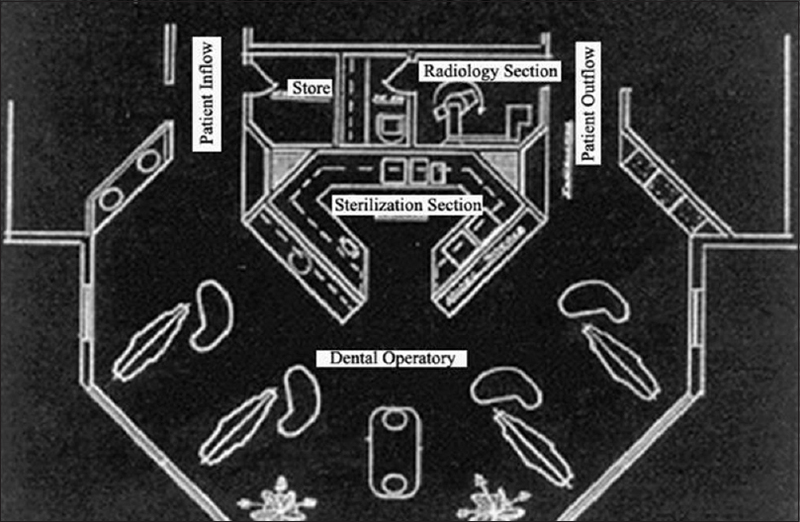 The schematic representation of sterilization room has been depicted [Figure 2]. Instituting an infection control programme. Infection control audit including inspection of waste disposal. Advice/liaison: To achieve this, it needs to encourage all grades of staff to use their ICT as a resource for advice and information. This may cover many different aspects of health care ranging from the care of an individual patient, or the correct decontamination of a piece of equipment. Dental office is subjected to a variety of federal, state, and local regulations concerning infection control, hazardous material handling, employee safety, and waste management issue both in India and abroad. Steam autoclaving is the method of choice. 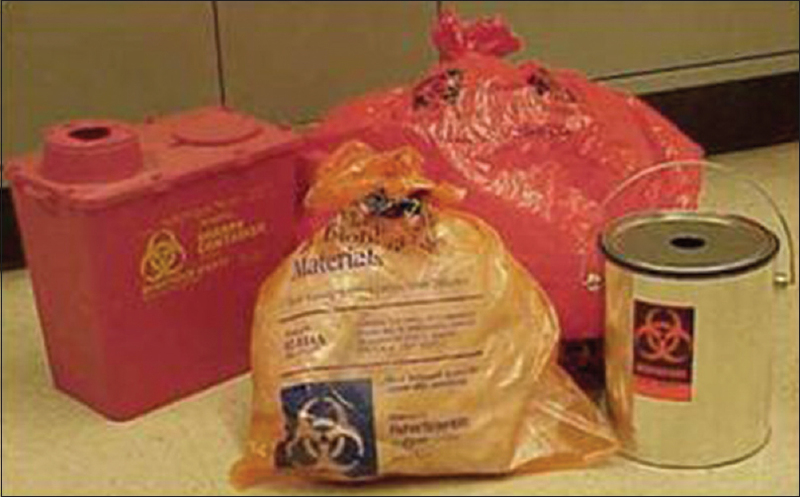 Pathologic waste should be wrapped before disposing. Any autoclavable plastic/plastic paper bag or pouch can be used. One common problem involved is the treatment of teeth containing amalgam restorations. The heat of sterilization could create dangerous mercury vapors, hence amalgam-restored teeth can be disinfected before disposal. Ideally, a sterilizing chemical (e.g., full strength-activated glutaraldehyde) should be used. A tooth could be added to a small volume of fresh glutaraldehyde held within a selected container. Exposure should be for at least 30 min. Proper handling of sharps is essential because common personal protective barriers, such as gloves, will not prevent needle-stick accidents. To minimize the potential for accidents, needles should not be recapped, bent, broken, or manipulated by unprotected hands. The use of some types of protective cap holding device or replacement of the capping sheath by "the scoop technique" with the syringe held in one hand is required. The color coding of waste collection boxes is shown in [Table 2]. It is the responsibility of the dentists to implement effective and efficient infection control policies in the dental office that would help prevent the outbreak of infections and cross-contamination, thereby safeguarding not only their own health and of the dental assistants but also of the ancillary staff, and even the community. British Dental Association. Infection Control in Dentistry. BDA Advice Sheet A12. London: British Dental Association; 2003. Infection control recommendations for the dental office and the dental laboratory. ADA Council on Scientific Affairs and ADA Council on Dental Practice. J Am Dent Assoc 1996;127:672-80. Recommended infection-control practices for dentistry, 1993. Centers for Disease Control and Prevention. MMWR Recomm Rep 1993;42:1-12. Guidelines for infection control in the dental office and the commercial dental laboratory. Council on dental therapeutics. Council on prosthetic services and dental laboratory relations. J Am Dent Assoc 1985;110:969-72. Cottone JA, Terezhalmy GT, Molinari JA. Practical Infection Control in Dentistry. 2 nd ed. Baltimore: Williams and Wilkins; 1996. Anil S, Samaranayake LP, Krygier G. Practical Infection Control in Dentistry. 1 st ed. Delhi: AITBS Publishers and Distributors; 1999. Hamula W. Orthodontic office design. Planning a sterilization area. J Clin Orthod 1991;25:375-81. Rosa AC, Brusca MI, Manto MC, Mosca CO, Nastri N. Effects of handling and storage on sterile dental instruments. Acta Odontol Latinoam 2001;14:35-9. Drake DL. Optimizing orthodontic sterilization techniques. J Clin Orthod 1997;31:491-8. Bentley EM, Sarll DW. Improvements in cross-infection control in general dental practice. Br Dent J 1995;179:19-21. Payne GS. Sterilization and disinfection in the orthodontic office: A practical approach. Am J Orthod Dentofacial Orthop 1986;90:250-2. Unthank M. Dental office planning. J Am Dent Assoc 1999;130:1579-82. Kumar Vinay KR, Mogra S, Shetty Surendra V. Hepatitis B: Facts and concerns to orthodontist in India. J Indian Orthod Soc 2007;41:30-4. Shulman ER, Brehm WT. Dental clinical attire and infection-control procedures. J Am Dent Assoc 2001;132:508-16. Occupational Safety and Health Administration. Regulations. 29 CFR Part 1910, Department of Labor, OSHA, 1991. Miller C, Paelnik CJ. Infection Control & Management of Hazardous Materials for the Dental Team. 3 rd ed. St.Louis, Missouri: CV Mosby Co.; 2005. Park K. Preventive and Social Medicine. 19 th ed. Jabalpur, India: Banarsidas Bhanot Publishers; 2007. p. 644-50. Bellavia DC. Efficient and effective infection control. J Clin Orthod 1992;26:46-54. Matlack RE. Instrument sterilization in orthodontic offices. Angle Orthod 1979;49:205-11. Pushpanjali K, Shaik Hyder Ali KH, Srivastava BK. Safe management of dental health care waste. J Indian Dent Assoc 2003;74:29-33.